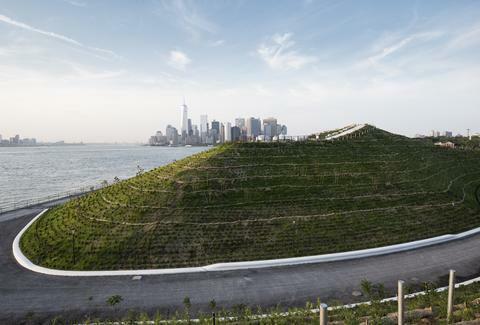 One of the few New York City islands not connected by bridge, Governors Island National Monument offers a 172-acre playground of open space, art exhibits, historical tours, and impressive skyline views rivaling any panoramic rooftop bar. To access the island, you can hop on the Governors Island ferry ($2 roundtrip, $20 season pass) departing from Brooklyn Bridge Park or Battery Park or take the NYC Ferry ($2.75, one-way) from various ports on the East River. Once on the island, you’ll notice a lack of cars, street-side garbage, and even tourists -- making it one of the most serene getaways within New York City. So what do you do once you’re there? Pack a picnic, a blanket, and a book, or plan to hit one of the many activities, parties, and festivals taking place on the island throughout the summer. Go rock climbing and zip-lining If sitting in the grass isn’t really your thing, the brand-new Adventures at Governors Island offers a zip line (with a 35-foot peak at the start) for $20 (that includes two tries) as well as a maze and rock climbing walls (both under $10). Bike around the island for free From 10am-12pm on weekdays, Blazing Saddle Bike Rentals lets you borrow a bike for up to an hour for zero dollars. Bike around the island’s perimeter and reward yourself with some Mister Softee after (by following the jingle to the Liggett Terrace Food Court). 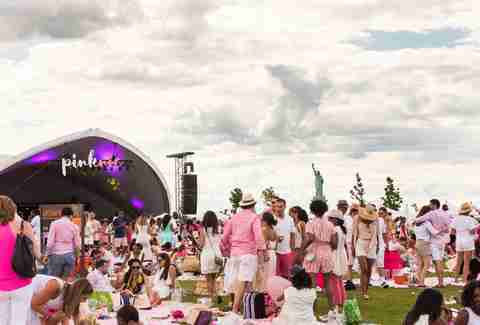 Drink rosé all day at Pinknic Break out your pastel romper (or RompHim): Rosé wine, rosé Champagne, and frosé are all on the lineup for this very pink, very paisley-friendly summer picnic. Picnic baskets by the Stanton Social’s Chris Santos and live music will keep you entertained while you wine. Tickets start at $65. Swim in New York Harbor at Governors Island Swim Always wanted to get into the water surrounding New York City? Wait, really? Well, here’s your chance. This 2-mile swim will circle around Governors Island to give you a perspective of Manhattan you’ve never had before. Entry is $120. 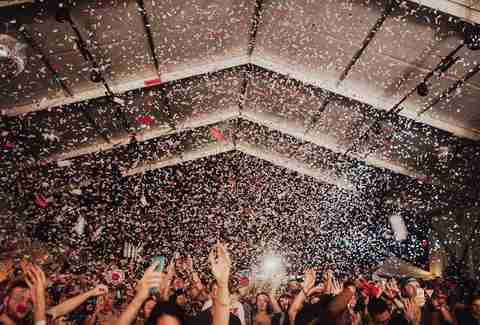 Put on a flower crown at dance at Full Moon Festival This one-day boutique music festival is back for its seventh year with a lineup including Vic Mensa, ABRA, DJ Harvey, Jeremy Underground, Awesome Tapes From Africa, and more artists. Tickets start at $40. Get wet at City of Water Day This water-themed festival, held across the city and in New Jersey, celebrates all the glorious waterfront activities you can participate in when you’re surrounded by rivers and oceans. 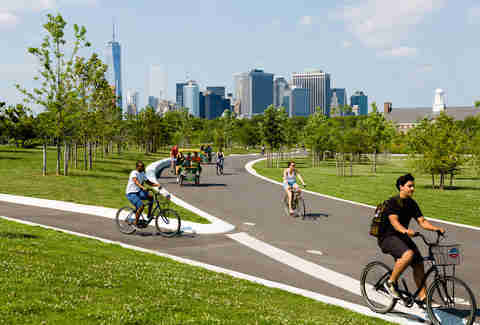 At Governors Island, you can expect free boat tours, rowing, kayaking, and more water-focused activities. Get poetic at NYC Poetry Festival Spend this weekend listening to slam poets, enjoying readings from local poets and authors, typing out your own haiku on a public typewriter, and enjoying an oddly intimate experience with The Poetry Brothel, which lets you commission a professional reader to privately recite poetry to you. Brooklyn Brewery will also be sponsoring a beer garden, should you need liquid courage. Rock out at the Brooklyn Music Festival Is there anything more Brooklyn than having a Brooklyn-themed festival that’s not technically in Brooklyn? Back for its third year, this music festival will showcase local talent including Lez Zeppelin, Shinobi Ninja, Ocean Noir, and Metanoiz. The event is free, but a $10 reservation fee (partially donated to the Center Against Domestic Violence) is recommended. 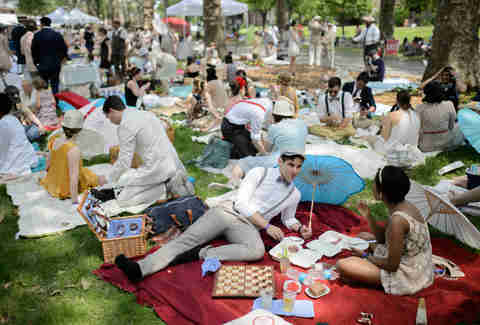 Dance like its 1927 at the Jazz Age Lawn Party If you missed the first rendition in June, this Prohibition-inspired weekend party returns with all the glitz, glamour, and throwbacks this weekend. Tickets start at $55. 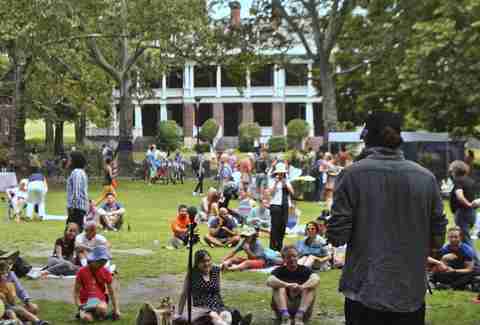 Pack a picnic and dine at PopUp Dinner This communal dinner/benefit for the Friends of Governors Island will provide the seating and table-clothed tables -- you’re just responsible for the food and booze. If you’re not into cooking, pick up picnic sandwiches and snacks at Brookfield Place before hopping on the ferry or order Seamless right to the ferry stop. Tickets are $40. Melissa is a writer living in NYC who once got stranded on Governors Island during a thunderstorm. It was fun. Follow her on Twitter and Instagram.